While I try to keep my makeup bag minimal for on the go, there's a few products that I always carry around for some last minute touch ups. With that in mind, I thought I'd share some of the products that help keep up my appearance throughout the day, without taking up too much space in your handbag! Something I love to spritz on my face throughout the day is MAC Fix +. I find a lot of people get this confused with setting sprays but that isn't what it's for. As an oily skinned girl, I often have to apply powder during the day and spraying this stuff on top gets rid of that overpowdered look. It's also pretty refreshing during a stressful day! 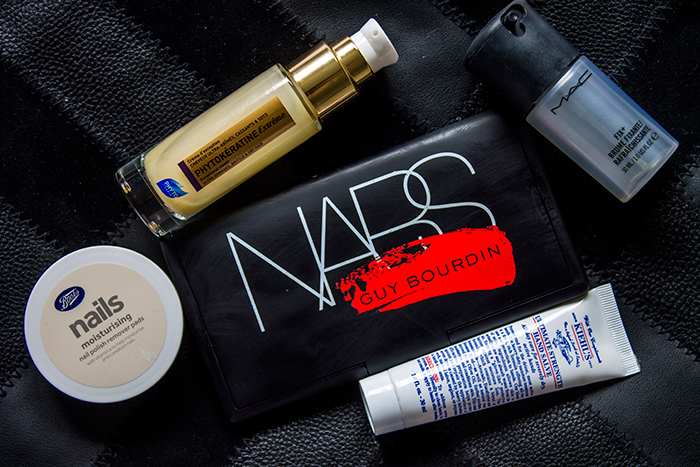 I love multi-tasking products and I'm always carrying around my NARS Cheek Palette. It's slim enough to fit into my makeup bag but it has a huge mirror and a selection of blushers and the bronzer that I can't live without. I don't always have time to apply product or straighten my hair in the morning so I love carrying around my Phyto Phytokeratine Extreme Exceptional Cream. It's basically what I would describe as a moisturiser for your hair. For me it instantly takes away the frizz and makes my hair feel much less dry but not weighed down with tons of product. You can also apply a lot of it without the fear of greasy hair. My job can be pretty hands on at times so I seem to always be chipping a nail these days. Nobody wants to be that guy reapplying their nail polish on their lunch break so I love having the Boots Nails Moisturising Nail Polish Remover Pads in my bag. It can take quite a few pads to remove the polish but for the convenience of not having to carry around nail polish remover, it's wonderful. Plus it has a gorgeous fruity smell so it won't bother your co-workers! My hands get so dry during the day so I've been carrying around the Kiehl's Ultimate Strength Hand Salve to do the trick. It has a sort of menthol ingredient in it that feels really cooling and soothing on the hands while also keeping the hands hydrated. I find that after using this my hands keep their moisture throughout the day, even after washing them. So those are my favourite quick fix products! What do you bring with you on the go?